It is the final countdown for the America’s Best Communities competition. Members of the community came out Monday to support Huntington and Huntington Mayor Steve Williams. 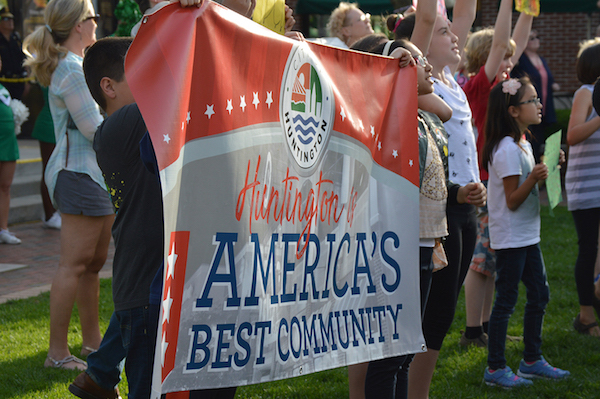 Three years ago, Huntington was asked to participate in the America’s Best Communities competition. The competition features communities that have a residential population from 9,500 people to 80,000 people. Over 300 communities in the United States chose to put together a revitalization plan for their city to be entered into the competition. Over the past three years, the city of Huntington has won $150,000 of prize money, allowing the community to take that and raise it into $12.7 million dollars. This prize money has created jobs in the community to create growth in the west-side of Huntington and in the Fairfield community. “Our future is bright. The pathway for what we are going to experience in the next 50 years is being set right here because of your efforts,” Williams said. Jackson Folwell, a Marshall senior visual arts and graphic design student from Parkersburg, West Virginia, found out about America’s Best Communities through his major and helping the community. America’s Best Communities is sponsored by Frontier, Dish, CoBank and The Weather Channel. Williams will be going to Denver, Colorado to give the final presentation Wednesday. The first-place prize is $3 million and the winner of America’s Best Communities will be announced Wednesday at 7 p.m.